Windows Spotlight is an option for the lock screen background that displays different background images and occasionally offers suggestions on the lock screen from Bing. 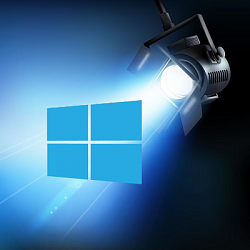 Windows Spotlight is available in all desktop editions of Windows 10. For example, Windows Spotlight will display different backgrounds daily that you can select that you like or don't like to help train the service to show you images you like. You could also see and try previews of other Windows features and experiences to help let you know about them. This tutorial will show you how to find and save the Windows spotlight background images displayed on your lock screen in Windows 10. Thank you to Dimitri for providing the PowerShell .ps1 script file. 1. Click/tap on the Download button below to download the PowerShell script. 2. Save the .ps1 file to your desktop. 3. Unblock the .ps1 file. 4. Right click or press and hold on the .ps1 file, and click/tap on Run with PowerShell. 1. Copy and paste the folder location below in the address bar of File Explorer, and press Enter to open the Assets folder. The folder location below is revealed in the LandscapeAssetPath string value in the registry key below. If you like, you can also right click on a file, click/tap on Open with, and select Windows Photo Viewer to view a listed Windows spotlight image. I forgot to copy the files to a different folder and now it's just a dark screen for me ( I tried to delete everything in the folder but no hope. Could you please tell me how to convert the files back to normal? If you mean that you renamed them inside the "Assets" folder instead, then you could just delete the contents inside the "Assets" folder to clear them all. Afterwards, toggle to use a picture for your lock screen background and apply, then set to use Windows Spotlight again. It should start fresh again. I tried that. It still gives me a black lock screen. UPDATE: It does download new files to the folder after deletion. When I open them with Paint, they look fine. I just don't understand how Windows can't read them. If you like, you might see if doing a system restore using a restore point dated before making the mistake may be able sort it for you. That's a great idea! Luckily there was a major update 2 days ago and Windows automatically created a restore point. It's back to normal now. Thanks, Brink!